Microsoft on Thursday updated two of its iPhone apps —Cortana and Bing Search —with support for 3D Touch on the iPhone 6s and 6s Plus, along with a number of other new upgrades. With both apps, 3D Touch enables quick actions from the homescreen icon. In the case of Bing Search, this means options to jump into voice search or a newly-added barcode scanner. The latter is part of a Deals module, and used for comparison shopping. The module also supports browsing for coupons, sales, and other offers from nearby shops and restaurants. Bing will now also fetch prices for local gas stations, highlight top dishes at some restaurants, and search through news content. In the Today feed, people can see weather data and pin Web bookmarks. 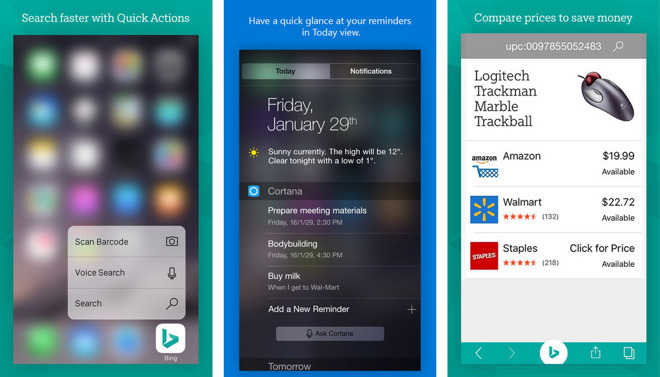 Cortana has added a Today widget of its own, used to display reminders and offer a shortcut into the app. Separately there's a new monthly reminder option, and Microsoft has smoothed out performance by reducing the app's load time, as well as improving how it copes with slow or unreliable Internet connections. Both apps are free downloads, and require an iPhone or iPod with iOS 8 or later.